Wheels with narrow openings can be a real bear to clean. Soft-tip brushes aren’t rigid enough to clean deep inside narrow openings. 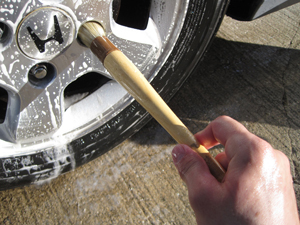 We experimented with stiff, nylon bristle brushes but they ended up scratching the wheel’s clear coat finish. The solution is this 1 inch Round Natural Detail Brush. This brush features two inch natural bristles which are stiff enough to get deep into crevices yet soft enough to prevent scratches. The bristles are epoxy set in a plastic ferrule to prevent scratching wheel or paint surfaces. The lacquered wooden handle is complete with a hang-up hole. This is a great brush to remove dust around instruments on the dash, air vents and the shift gate on the console. I also use this brush with a quick detailing spray to remove wax residues in body seams and around moldings and emblems. 1 x 12 inches.